These are some business cards I did for a good friend a while back. She is a physiotherapist who works at several clinics in France and needed something to give her clients so that they would know where to find her. The biggest challenge with this one was figuring out how to fit all the information and imagery (including two addresses) onto one card without it feeling too crowded. She also wanted to the card to show off a bit of her personality as well as her focus on posture and alignment. I ended up creating some custom graphics for the card and we were able to get all the pertinent information well organized. The cards were so popular she’s already had to reprint them! I have been working with Sam for a while now and am excited to show off the results. 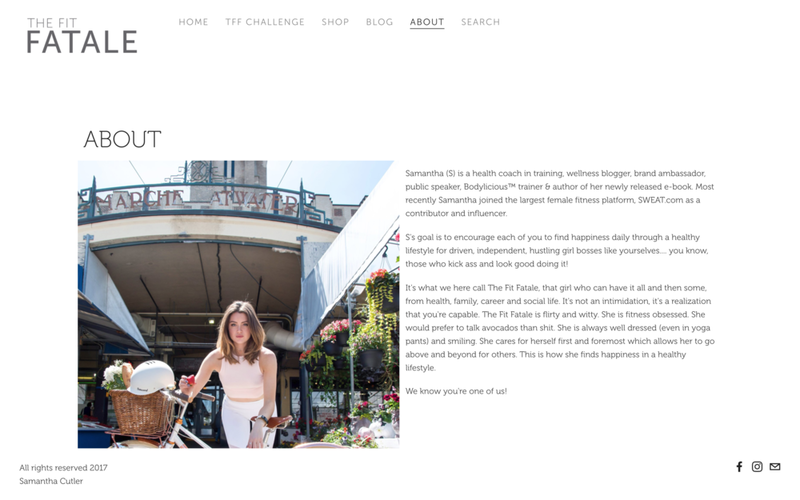 The challenge with this project was in maintaining the wonderful visual look & feel her brand already had, while giving everything a bit of an update and to better reflect her current content. Like many creators the focus of Sam's work has shifted over the years and her new name/logo and website needed to reflect that. She wanted to promote health, wellness and an active lifestyle, but she also wanted it to fit her style and personality. She also needed something that she and her team could easily work with, that gave her the tools to connect with her audience and would give her e-commerce capabilities for all of her digital products. So Silver Lining by S became The Fit Fatale and we worked together on the visual brand and website. The best part about working with Sam is that she really does have a clear idea of what she wants and what her audience is looking for. And while getting there took work, her understanding of her audience, her vision and hard work really helped things come together very well. It was also great to not only get to work on the logo, textures and business cards, but her site as well. It's nice to be able to evolve a project and watch it grow with your clients needs.